In 366, the itinerant monk Yuezun was wandering through the arid landscape [around the Western Chinese city of Dunhuang] when a fantastical sight appeared before him: a thousand buddhas, bathed in golden light. (Whether heat, exhaustion or the strange voice of the sands worked themselves on his imagination is anyone’s guess.) Awed by his vision, Yuezun took up hammer and chisel and carved a devotional space into a nearby cliff-face. 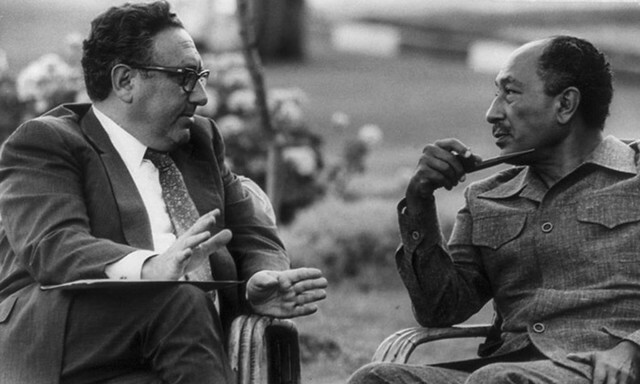 It soon became a centre for religion and art: Dunhuang was situated at the confluence of two major Silk Road routes, and both departing and returning merchants made offerings. By the time the site fell into disuse in the 14th century, almost 500 temples had been carved from the cliff. Learn more at: “The Oldest Printed Book in the World.” Then page through the British Libraries digitization of its restoration. As we treasure tomes, we might recall that it was on this date in 1990 that Tim Berners-Lee published a formal proposal for aa “Hypertext project” that he called the World Wide Web (though at the time he rendered it in one word: “WorldWideWeb”)… laying the foundation for a network that has become central to the information age– a network that, with its connected technologies, is believed by many to have sparked a revolution as fundamental and impactful as the revolution ignited by Gutenberg and moveable type. As we look it up, we might we might recall that it was on this date in 2007 that Apple released the first iPhone…. the device that ushered in the smartphone and that, with Wikipedia (which dates from 2001), contributed to the decline of Encyclopædia Britannica, which ceased print publication in 2012. 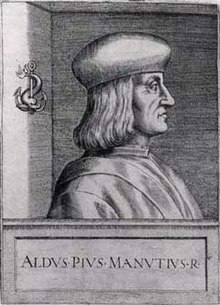 As we put ourselves in perspective, we might spare a thought for Aldus Pius Manutius (AKA Aldo Manuzio); he died on this date in 1515. A Venetian humanist, scholar, and educator, he became a printer and publisher in his forties when he helped found the Aldine Press. 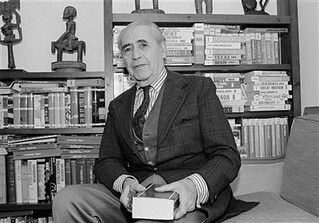 In the books he published, he introduced a standardized system of punctuation and use of the semicolon; he designed many fonts, and introduced italic type (which he named for Italy); and he popularized the libelli portatiles, or portable little (specifically) classic books: small-format volumes that could be easily carried and read anywhere. 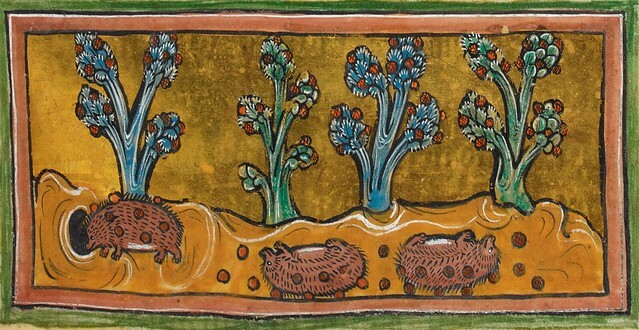 Hedgehogs rolling on the ground to collect grapes for their young, as illustrated in the Rochester Bestiary (England, c. 1230): London, British Library, Royal MS 12 F XIII, f. 45r. Hedgehogs were said to creep into vineyards when the grapes were ripe, to climb the vines and shake the fruit down to the ground. Then, rather than eating this bounty on the spot, they would turn onto their backs and roll around, impaling the grapes with their sharp quills. They could then trundle off back to their burrows, carrying the grapes on their spines, as a meal for their young. The bestiary writers allegorized this as a warning of the clever stratagems of the devil in stealing man’s spiritual fruits. Longstanding readers of our Medieval Manuscripts Blog may know that we have a penchant for hedgehogs. In 2012, we published a post entitled The Distinguished Pedigree of Mrs Tiggy-Winkle,based on the accounts of their behaviour in medieval bestiaries. In 2014, we brought you a hedgehog beauty contest, no less, featuring images of five of our favourites. And most recently we focused on the heraldic hedgehog in the 13th-century Dering Roll. * Archilochus, as quoted in Isaiah Berlin’s wonderful The Hedgehog and the Fox. 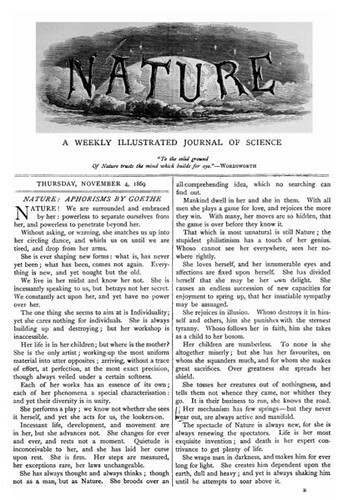 As we roll in it, we might recall that it was on this date in 1869 that the first issue of the journal Nature was published. Taking it’s title from a line of Wordsworth’s (“To the solid ground of nature trusts the Mind that builds for aye”), its aim was to “provide cultivated readers with an accessible forum for reading about advances in scientific knowledge.” It remains a weekly, international, interdisciplinary journal of science, one of the few remaining tat publish across a wide array of fields. It is consistently ranked the world’s most cited scientific journal and is ascribed an impact factor of approximately 38.1, making it one of the world’s top academic journals. 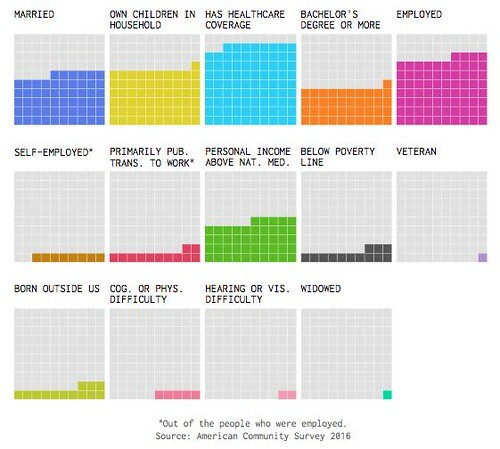 About 20 per cent of the United States population (60 million out of 300 million people) are non-native speakers of English. Speaking multiple languages has advantages – for example, you get to talk to people from different cultures. But being a non-native or second-language (L2) speaker also has its challenges. In addition to often feeling self-conscious about their accents, L2 speakers can be viewed by native speakers as less intelligent, and less trustworthy. As we filter signal from noise, we might recall that it was on this date in 1535 that The Bible, that is the Holy Scripture of the Old and New Testament, faithfully translated into English— better known as the Coverdale Bible— came off the press in Antwerp. 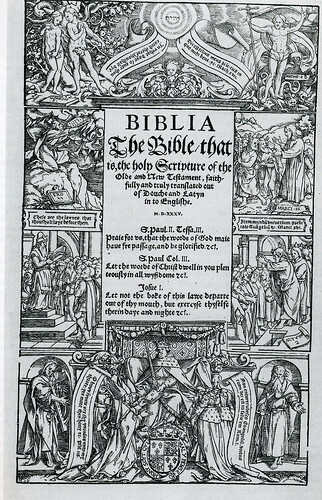 Prepared by Myles Coverdale, it was the first complete Modern English translation of the Bible (not just the Old Testament or New Testament), and the first complete printed translation into English (using William Tyndale‘s New Testament work together with Coverdale’s own translations from the Latin Vulgate or German text).